I usually draw a blank when looking for someplace to eat when my parents come to visit. Being that they were visiting for my birthday, I had a little more of a say in where we would go than usual. My father would never say no to a steakhouse, so I figured Central Steak was a formidable option considering the area in which we wanted to be. Central Steak is located at 1632A Central Avenue, west of Wolf Road in the building that used to be The Butcher Block. We were seated promptly on a Sunday afternoon in a large room with large windows allowing for a pleasantly bright environment. The dinner menu is rather straightforward. My father made the comment, “they don’t have much of a menu” in reference to the fact that it was one page, front and back with 5-10 selections in four categories including small plates. It is clear by the selection that they don’t “muck about,” as Jaime Oliver would say, and that they take the few things they cook very seriously. 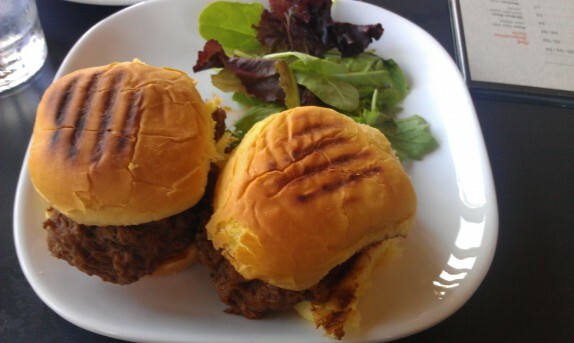 …but not before we enjoyed some beef short rib sliders. The slowly cooked beef was succulent, sweet, and had a hint of spice. It was served on potato rolls with a dollop of boursin cheese. They were lightly grilled and served warm. The young man brought us some salad. 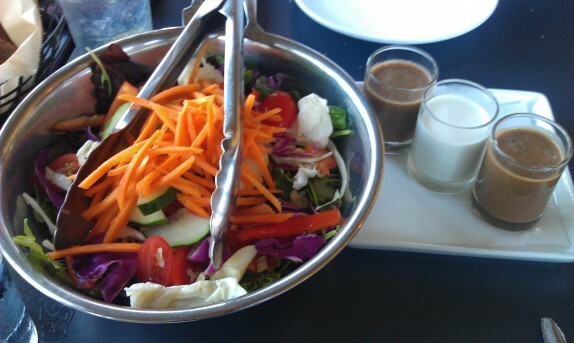 There were two different dressings served with the salad: balsamic vinaigrette and blue cheese, the latter of which was mild, and perfectly creamy. The bowl of veggies served was an interesting mix of greens, including spinach, arugula, and Swiss Chard (which is delicious! ), cabbage, red peppers, cucumbers, carrots, and grape tomatoes. Everything about this salad was very good. My burger came out. It was pretty ridiculous! 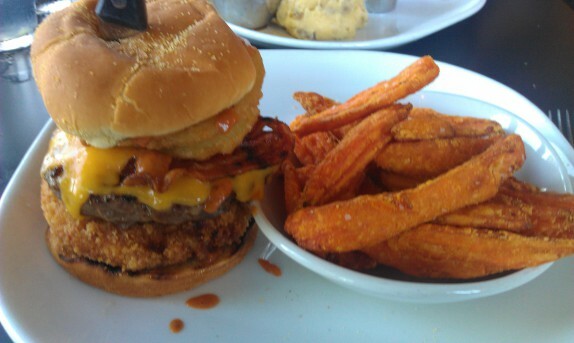 Macaroni and cheese was formed into a patty as big as the burger that was deep fried with a crispy course breadcrumb shell. The cheddar cheese, used in the mac and cheese and on the burger, was nice and sharp. 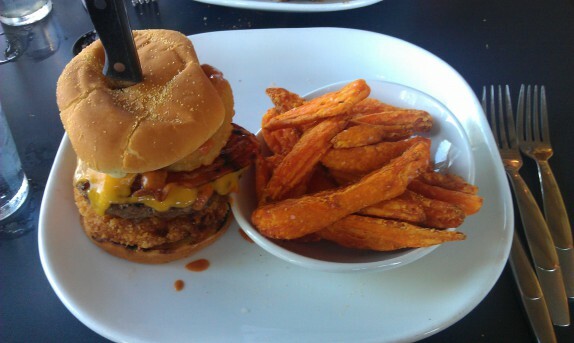 The bacon was pretty good, and the onion rings were nice and crispy. The special Central Steak sauce was the sweet counterpoint that was necessary with the sharp cheese and salty bacon; sadly enough there was not enough on the burger, but that was a blessing, as it allowed me to focus on tasting the meat in its unadulterated entirety, and, although I craved more of the sauce, I enjoyed the whole burger as well as the sweet potato steak fries, which were decent albeit slightly under-fried. Ohh and did I mention that my parents were there? 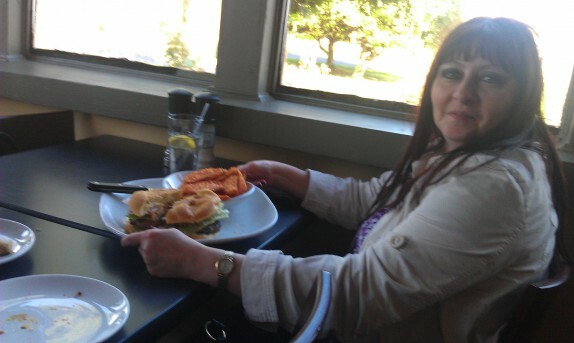 Mom had a less ridiculous burger. SAY HI!!! Dad had filet mignon. SAY HI!!! 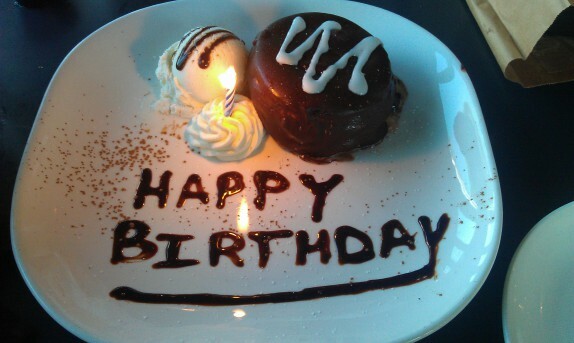 Being that it was my birthday, and my dad, naturally, announced it the second we stepped into the restaurant, the server, who was nothing but kind and accommodating the whole time, went well above and beyond his obligations as a server and brought desserts for the table on the house. And, furthermore, he didn’t bring a marching band of crazy servers singing a dumb “happy birthday” song ; it was very low key and special. And there was a candle. The one dessert pictured above was a chocolate bomb cake, smothered in chocolate ganache and filled with chocolate cake and mousse. The other dessert, not pictured, was a toll house pie (one of my favorite desserts in the universe) with oreo crumb crust. Both were served with ice cream and were devoured by the four of us (Cassie was there but opted to not be photographed) in beyond record time . Before the desserts came out, I had looked over to Cassie and mentioned my love for everything I had eaten; I intend on making this a regular stop on the derryX train, as they do great work. The dessert put the whole experience over the top and made a special day even more special. I want to thank everyone involved in the day, especially my parents and Cassie, and would also like to add a special “Thank you” to Central Steak and our server for doing such a great job. 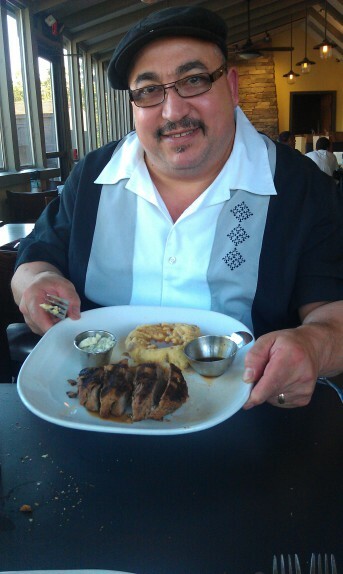 My boyfriend’s good friend Dave is the chef at Central Steak! So glad that you enjoyed the meal! We had a great time there on Valentine’s Day. Their menu is simple and direct, not alot of garnish, just good, tasty food! That’s awesome, Kat. 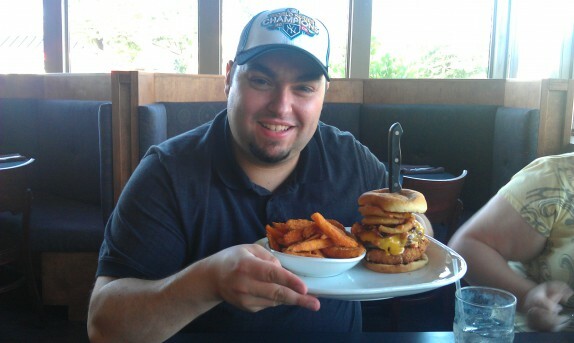 If you talk to Dave, tell him the burger derryX had needs to become a regular menu item! It was greatness! Please tell me, you only wore the hat to pose for the pioture. That looks awesome! You look just like your dad, too. That’s what a lot of people say, but they haven’t seen the people on my mom’s side. I actually resemble them much more.